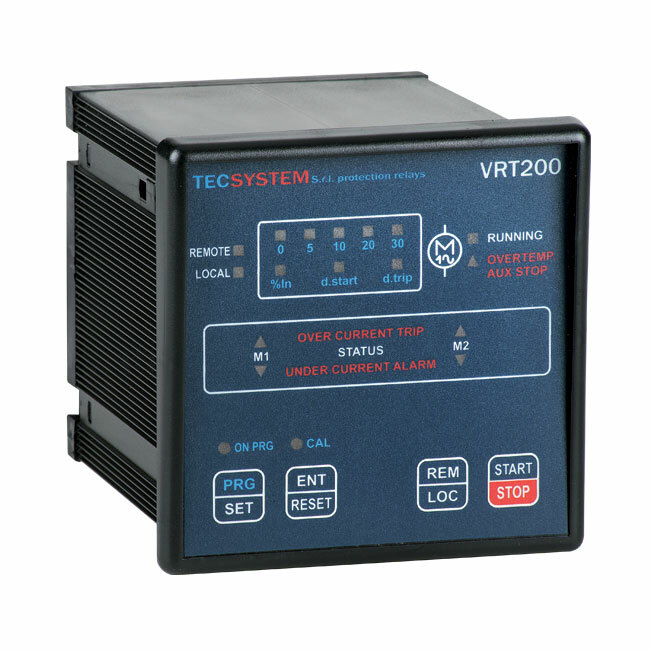 The VRT200 ventilation fan controller is designed to control a ventilation fan in coordination with monitoring the transformer temperature. It contains 1 contact to enable remote control of the fans, and another 2 inputs to monitor temperature via a Ptc sensor, or auxiliary contact. The 2 output relays carry up to 5A at 230VAC to power the fans. There is also a fault/alarm relay for signaling undercurrent or overcurrent conditions with the fan motor, indicating a problem with operation. A key panel in the front allows for manual start/stop of the fan(s) and an AUTO-TUNE feature helps you set up motor protection parameters.